Why did you start using chalk? I really wanted a very flat, matte finish so that I could easily manipulate it for an aged look. At first I thought I might try milk paint again. It had been several years since I used it, but remembered the dull, chalky old look of it. Looking for chalky looking paint, I wound up finding Annie Sloan Chalk paint. And the hype was pretty darn good. I doubted it was that much different than regular flat latex paint. But it is .... and it isn't. Could you have done most of your projects with a cheaper paint and still have been as pleased with the outcome? Mostly yes, but there were times when regular paint would not have given the same finish. Flat and matte finish paints will sand off or distress, but not definitely as easily or as well as the chalk paint. And I've been painting furniture and everything else for many years, and the chalk paint is actually easier to use the less you know, and great to use if you are very experienced with painting. 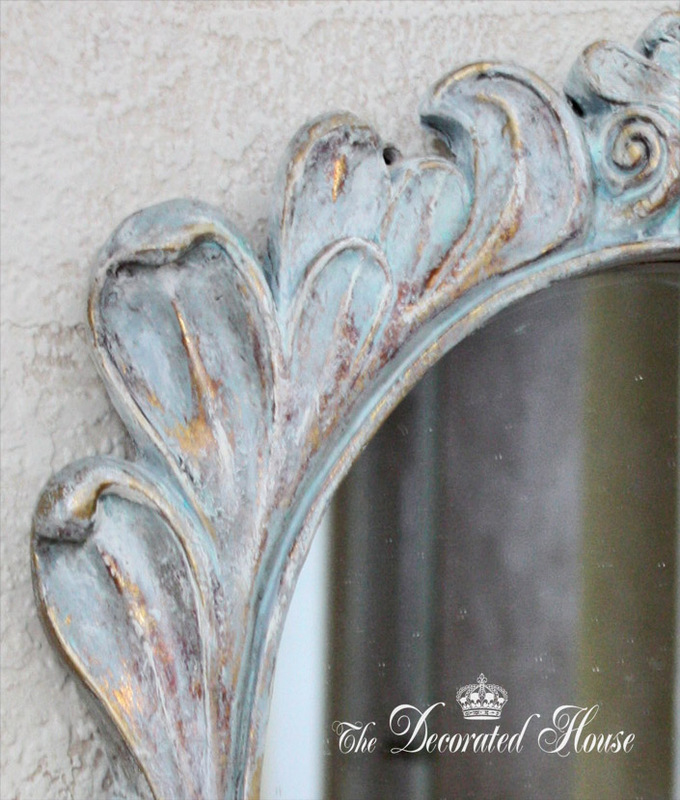 How about the blue mirror in the last post, was the chalk paint that important? Yes. This is the first time that I found the paint and wax made a such huge difference. 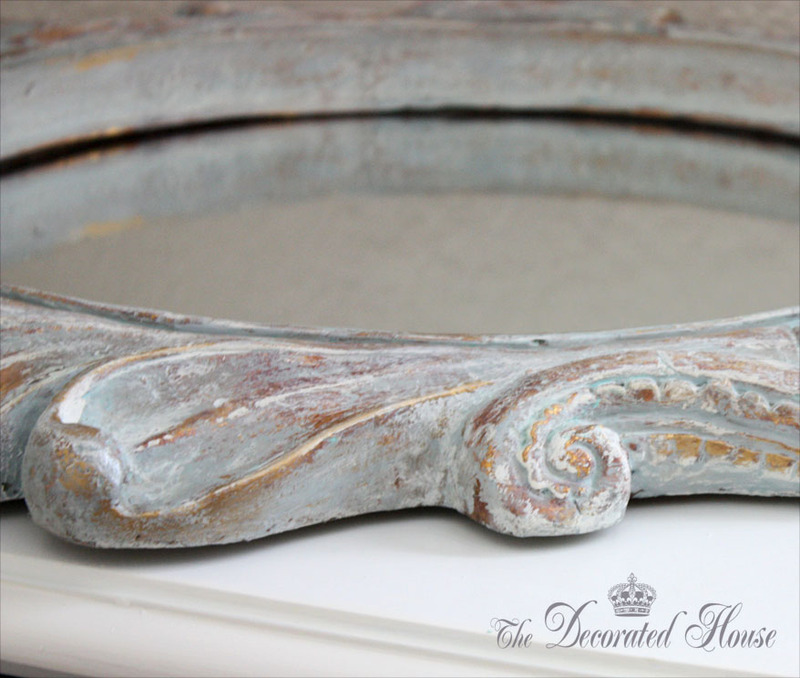 The mirror finish came about due to the properties of the chalk paint. There was a play between the paints and the wax that would not have been the same while painting, nor looked the same with afterwards by using other paints and a paste wax. Is the wax a lot less work than paste wax? Not to me. But others have said it did not take a lot of buffing for them. To me, I had to put some buffing elbow grease into it anytime I've used the AS wax, maybe a little more than paste wax. It has been a while since I used the paste wax on a large project, but I do remember it is work. And worth it, just as the AS wax is. When you use a damp rag to wipe off the paint or excess, is the paint still wet, or do you let it dry first? 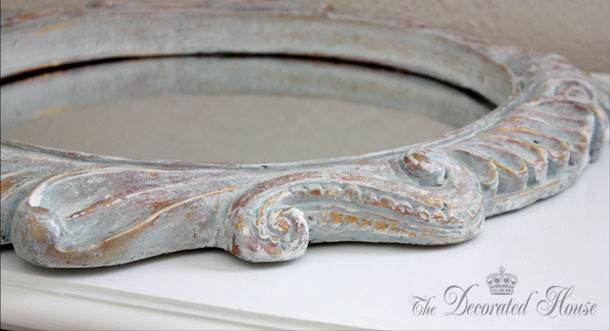 When doing an antique glazing, you apply the glaze, and quickly wipe off the excess. Usually a glaze is darker than your base paint color, and you need a damp cloth to get the excess off. Often quickly because the glaze pigment can stain the areas you don't want glazed or darkened. So when working with a glaze, wipe it off before it dries. With the chalk paint, you want it to set up and be more dry if you are using the damp cloth to distress it. Don't wipe too soon, or too much will come off. Wait until it dries too much, and it is just more work, but it will still come off. A kitchen scrubby works wonders if it gets dry before you get back to it. But again, the scrubby and the cloth will give you slightly different looks. Where do you get this gosh darn expensive stuff? It is available all over the place now! You can order it online, just look up Annie Sloan Chalk Paint Stockists in a search. It will be much cheaper if you can find someone who is local to skip the expense of shipping. I did pay shipping for the first year I used the paint and thought it was still worth it. The paint was about $40 a quart the last time I bought it, and often runs another $10+ shipping depending how many cans your order. It is usually cheaper to buy more than one can at a time. There is the huge advantage of being able to paint without much prep. Just clean the item well, and start painting. No sanding or primer usually. That in itself is the reason most people think it is worth the price after using it. It is still very expensive, compared to larger brand paints. This post is not a sponsored by the paint company. It is just a little information to help you decide what kind of paint you might like to use for your project. That was really helpful. I keep thinking... nah... i don't paint that much stuff to make it worth buying, and then i find myself painting something again, that would be perfect with ASCP! The paitina on the mirror is amazing! Hello!! i just discovered your blog. What a lovely place to unwind and see beautiful things and get great ideas!!! I feel like I stepped into a lovely shop!! Thank you for a wonderful blog. Thanks for your insight on chalk paint. I have been contemplating making the purchase also. Sorry I have not been by to visit your blog in a while. Things have been unbelievably busy for me this summer. Hope you've had a wonderful summer and finished up all your outdoor projects. Donna this is the best post about this kind of "faux painting". I' d been looking for the how to for a long time. Finally I found in your blog exactly what I was looking for, thank you very much. From Buenos Aires, Arg.,Julia C.
I hope you were able to find a paint that would work for you! Great tips!! Incredible end result. 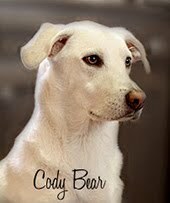 Happy to have found your blog...loved this post! Before I became an ASCP Stockist, I wrote a blog post in defense of the cost of Annie's paint. I am addicted to the stuff. Love..love the blue framed mirror. Just gorgeous...well done! I will be back for more inspiration. Hi! I love the idea of using chalk paint. Can you use it to give old doors an antique look or would paint work best? I'm going to use them at my wedding reception and want them to look sort of cream and distressed. Any tips would be much appreciated! Can the chalk board paint be used to antique old doors or would regular paint be best? Chalk Paint would be very good, "chalk board" paint might not give you the look you would want for the doors. You can always practice on a piece of wood and see how it looks to you. I hated the thought of investing in AS chalk paint so of course I first tried all of the recipes out there with mixed results (no one warned me about the white flecks of plaster of paris that don't all dissolve when mixing it with black paint. When buffing out the wax after two coats of paint, they mysteriously appeared--sob!). I eventually had to try it out for myself and have to say that whenever I can afford it, I will fork out the cash. I drive 55 min. away to get it too. The AS Chalk paint is so much more creamy and just glides on like butter. It really seems to go a long way too because of it. The wax is softer too and you have to be careful not to over use it. Love the mirror finish. I'm a sucker for those fancy French-inspired mirrors.. I totally agree with you! The first time as I said, I paid shipping for mine. I order 3 cans and there was a flat fee for all three so it made it a tiny bit easier to rationalize paying it. I continue to use it, and have tried some of those homemade formulas, and again agree with you, it's not the same! I do use plaster of Paris in my paints, or even cement, when I want something to look like really rough and outdoorsy. I have used ASCP for some years here in the UK & I am a huge fan - I have several colours at home & I just love the freedom of being able to change things that I have or upcycle thrift shop things. I did the courses too (my educational mind …. ) but it really is as simple as just doing it …. I have several finished items on my blog for those still sceptical about it. Thanks for joining in the conversation about chalk paint and for adding your own thoughts on the paint.